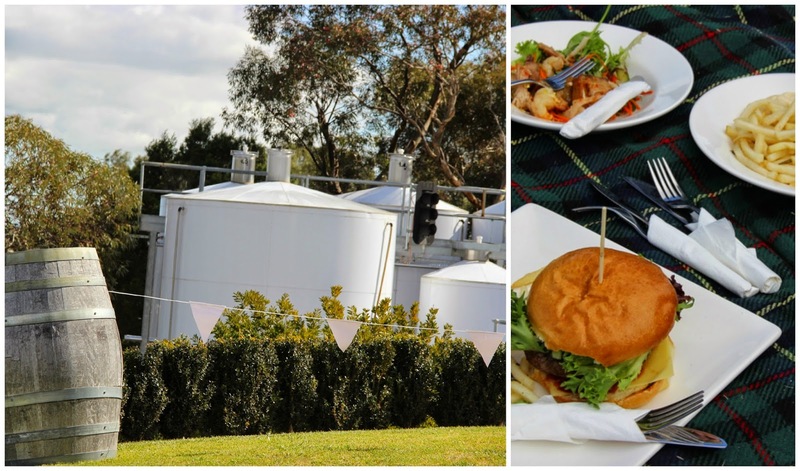 I have been sharing my family's weekend adventure to the Barossa to take in the 2014 Gourmet Weekend last weekend which you can read about here and here. We started our Sunday with a small family scuffle about the location of breakfast so to keep the peace ,we shared the love and had a movable breakfast over two locations! 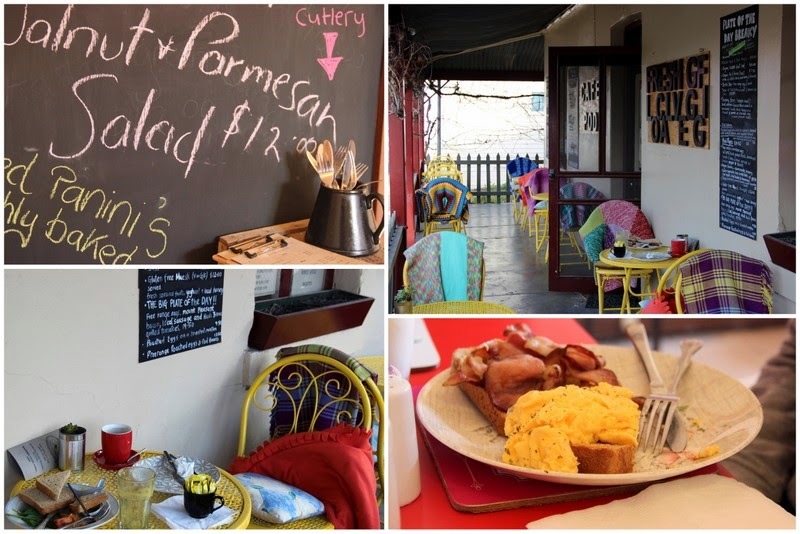 Our first stop was Café P.O.D in the main street of Tanunda. The Little Gourmets breakfasted while we enjoyed the first coffee and took in the eclectic mix of furniture and crockery while talking about what we could squeeze in before we had to start heading home. Next on the list was breakfast for the Big Gourmets and we headed to Jacob's Creek in search of the kitchen garden and their toasted muesli with poached pears and honey and cinnamon yoghurt. 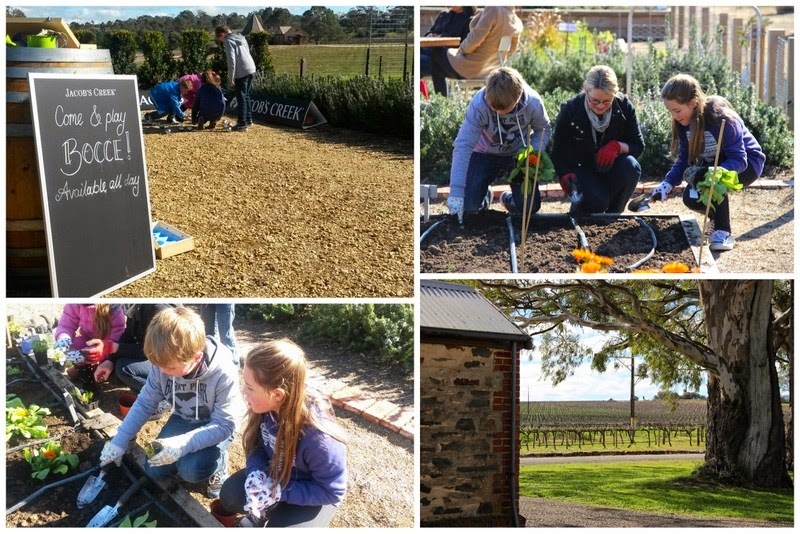 We found ourselves in a beautiful spot, sitting in the kitchen garden in the sunshine while the children had the opportunity to take part in a hands-on gardening experience with one of the Jacob's Creek staff members and a couple of other children. They planted in the garden as well as learning about and tasting a few of the other things growing there. They also planted their own seedling to bring home. After retiring their gardening gloves, they tried their hand at some bocce and kicked the ball around with some new found friends while we took in the view and tried some of the liquid produce! Our last stop for the weekend was Kellermeister where we rolled out the picnic blanket, took in the view, the sunshine, the sounds of Blue Lagoon and some magnificent lunch! The mood was relaxed and just how Sunday should be. It was here that some of the travelling party ignored calls to prepare themselves to leave and made not so subtle enquiries about schools in the Barossa area and hints about the kind of house they would like to live in!!!!! So we had the most fantastic weekend, which we are still talking about and we will most certainly be going back for more. The 2015 Gourmet Weekend in already on the calendar as well as the possibility of visits for other pursuits. This weekend has not been nearly as much fun as we catch up on the jobs we were not doing while 'gourmetting' around last weekend! Such is life....it does make the adventures more special when they happen though. I think we will be holidaying in the Barossa very soon!! Sounds like an awesome place, we really should have been there already being South Aussies. 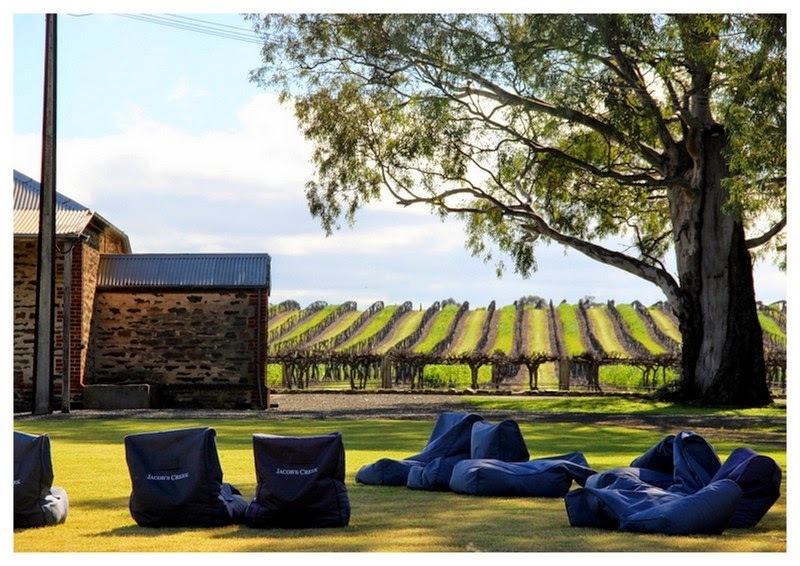 How I wish I was in one of the beanbags on the lawn - bliss. They look pretty inviting don't they? It was a lovely weekend Paula. I would highly recommend it...any time but especially the gourmet weekend!